The power windows, locks and mirrors are not working on my vehicle. I cannot find any fuse, breaker or relay that is labeled in the interior fuse box or power distribution center in the engine compartment for these circuits. Can you give their location and name? Here are some guides and diagrams (below) to help you do some testing on the fuses so you can get the problem fixed. It is the same fuse for windows, door locks and mirrors. You may also have to check the wiring harness that goes into the driver door, hinge side. With the driver door getting the most action, sometimes those wires break. For the power windows, under hood fuse box, fuse #f12 - 50 amp. 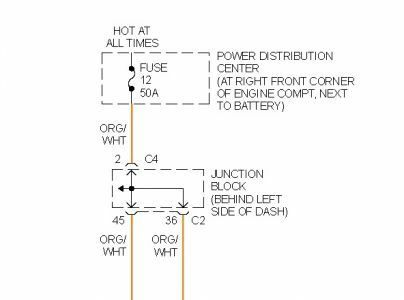 Check out the diagrams for the fuse location and the wiring diagrams so you can see how the system works. (below). Please let us know what happens. I replaced the fuse and got the windows working. But I cannot adjust my mirrors also. The light that illuminate the switch are out the lock for the driver side door does not work but my locks for the other doors work. I would check voltage and ground for any circuit that doesn't work. Check the wiring harness that goes into driver door. That harness gets a lot of work every time you open and shut that doors, broken wires are not uncommon. Just to add, the wiring harness that goes into your driver door on the hinge side probably has protective rubber boot covering. Pull the covering back far enough to see wire colors. Orange wire with white tracer is voltage for power windows, hot all the time. Use a test light to check for voltage. The black wire is ground, check it also. Under dash and not really sure there is no cover on it and manual does not tell me fuses. I looked up on internet to see which one was window fuse, but that one is good. Has good power to it. If window fuse has good power then check window switch with volt meter or test light to see if they work if they work and motor does not then check for broken wire in door jamb as that is pretty common. Also, see picture for a tip on windows not working. I just tried to search out a post that people constantly add to over the years. There were other experts who also answered it. I just got a notification that it was added to about a week ago (I did not reply, as it was just a "I had the same problem" and a "thank you") Without my replying, I was unable to look through my recent "My Replies" to find it quickly. Maybe you did not check the black wire thorough enough, It seems that it has been the culprit in the many, many replies of that post of multiple pages, that I cannot find at the present time. I was able to find a Sunday, July 10, 2011 off-shoot from that even older question/ Pay attention to the location of the problem/ see my link! Let's hear some good news! I have checked black ground through and through pulled hard to get it to come out and nothing it is tight and snug. I will check the switches themselves. But wondering if I need to take off from inside of door panel or if I could take off outer plastic cover to access switches themselves? See picture for panel removal switch may be held in with springs/screws or clips. All of a sudden my windows did not seem to roll up and the door locks also do not work. The control unit is on the driver side. It can control all the windows and door locks. I went to a used parts store and got another one, replaced it but it still does not work. What else can I look at? I got the same exact problem on my daughters 2004 Grand Cherokee. I found the answer on this site a few minutes ago. Check the wiring between the driver door and the body, in the rubber boot. In my case the black wire is completely severed. This seems to be a common problem. I have not fixed the wire yet. Trying to find a way to do it without cutting the rubber boot. What fuse is for electric windows and mirrors? Electric windows and mirrors are not working. Windows are considered a safety system, so they will use an auto-resetting circuit breaker, not a fuse. Look first for broken or frayed wires between the driver's door hinges inside the rubber boot where the wires pass from the body to the door. See the attached guide for switch testing/replacement as well as the attached wiring diagram. A year ago I was told by a Jeep dealer that the wires (thick black and pink wires) in the boot of the door were broke from wear. I believed they were cut. Anyway, I was able to get the wires connected and the windows worked. I did this twice (each time the wires slipped from the connectors). This is third time I connected them nothing worked. I checked all fuses (inside Jeep and in engine area) all are good/fine. Since the wires were cut or broken from wear the windows, steering wheel sound system controls and the vehicle information center will not work. Is there something more to it than before? As far as the windows, did you check for voltage at the fuse? If nothing else, twist the wire ends together, solder, use electrical tape and shrink tubing. I do not know what type connector you were using? They make one that clips onto the wires and cuts into the wires at the same time. The tan wire with lite blue tracer should be hot going into driver door. The black wire is ground. Windows will not roll up and cannot adjust side mirrors. Have checked fuses and did not find any problem. If the applicable fuse has a bare spot over each leg, no need to pull the fuse. If the fuse circuit shows to be hot all the time, just use a voltage tester on the bare spot over each leg, if both bare spots are hot, you know the fuse is good and there is voltage on the fuse circuit. Even if the fuse is good, if no voltage to the fuse, the circuit is bad. If you already checked all this, we will try something else. The fuse in the diagram is for the power windows. Windows do not work, and the interior light will not go off. What could this be? I know It is not a fuse, checked all of them. Hi Teddy. Just had the same problem and found the answer somewhere else on this site. The cause is a cracked or broken wire in the rubber boot between the door and the vehicle. Pull the boot of the plastic casing and find the wire. Mine was a broken black wire. The white plastic casing will slide out if you pull on the to plastic pieces at the top and bottom of the casing. I fixed the problem in five minutes with the help from this site. It rocks. Good luck! Why Wont My Power Window Go Up, On The Driver Side? Window Is Completely Down. Other Windows Work Properly. Could It Be The Switch Or The Motor?